I heard that Nino Bien will be opening once again on Thursdays in Centro Region Leonesa. 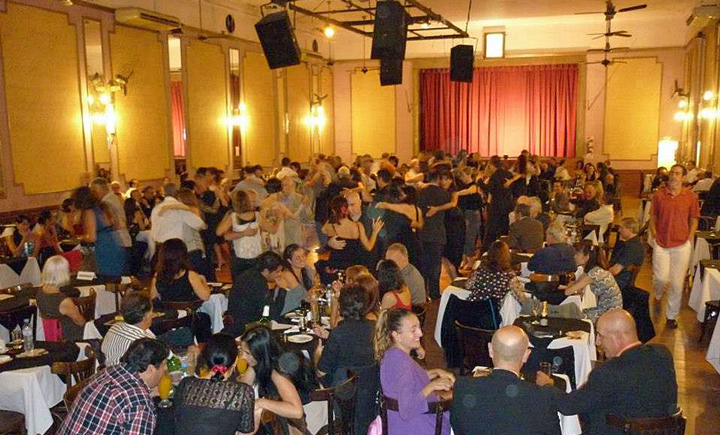 The milonga organizers and the club board came to an agreement. I just came back to Los Angeles from Buenos Aires in March, 2013. When I was in Buenos Aires, I went to several milongas except Nino Bien ( I don’t know why). I said to myself I’ll dance Tango in Nino Bien next time I come to BA. Now this news……..Sad, sad!! Luis Calvo and Gaby ran Nino Bien for 15 years. That’s a long time for milongas these days when some don’t last months. I heard about the closing one day after the fact. And I live 13 blocks from Centro Region Leonesa. The fact that dance floors are worse than ever may stem from the fact that most of the Argentine couples who travel to teach are dancing an exhibition style that is choreographed, not a social style that is improvised. People see them and think that’s the way to dance in the milonga. Is it any wonder the dance floors are chaotic? Teaching reflects life these days — fast and complicated. Simplicity is not in demand. Argentines sell what people want to buy, not what they need to progress as social dancers. The codes and customs of the milongas are not taught. I blame the teachers for that, not the dancers. Winning a tango championship guarantees work abroad. And they don’t even have to know how to dance in a milonga to teach. Wow, it is unthinkable to me that this has happened, but it’s also unthinkable to me that tango has become so tacky. But you and Alberto and some others of us are indeed very fortunate to have had the experiences we had in places like this with the people who mattered.